STS-121 commander Steven Lindsey undergoes emergency egress training session in the Space Vehicle Mockup Facility at the Johnson Space Center. 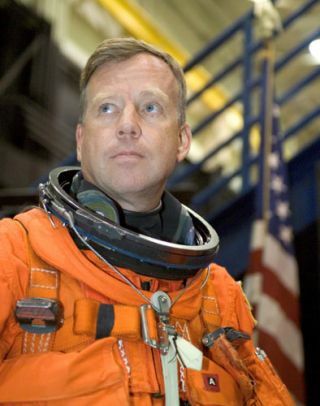 As NASA honors the memories ofastronauts lost in the pursuit of human spaceflight, the commander of theagency's next shuttle mission is also looking toward the future. U.S. Air Force Col. Steven Lindsey,commander of NASA's STS-121 Discovery flight, and his six-astronaut crew aregearing up for a packed few months of training. The spaceflight's current,20-day launch window opens on May 3, NASA officials said. "We're getting really busy now withthe training to make that date," Lindsey told SPACE.com. Lindsey, shuttle pilot Mark Kelly,mission specialists Michael Fossum, Lisa Nowak,Stephanie Wilson, Piers Sellers, and European Space Agency (ESA) astronaut ThomasReiter are bound for the International Space Station (ISS) on what will beNASA's second shuttle flight since the Columbia disaster. Much of the crew's mission trainingare refresher courses to maintain their skills, though several long, integratedsimulations with shuttle and ISS flight controllers are set for the nextfew months, Lindsey said. Slated to launch in September2005 following NASA's first post-Columbia flight--STS-114, also aboard Discovery--theSTS-121 mission suffered a seriesof delaysas engineers worked studied foam insulation debris problems associated with aprotective ramp on shuttle external tanks. An unacceptably large pieceof foam fellfrom the ramp during Discovery's STS-114 launchin July 2005, but did not strike the orbiter. A similar foam shedding eventdoomed Columbia'sFeb. 1, 2003 launch, when a chunk of insulation pierced the orbiter's heatshield and left it vulnerable to hot atmospheric gases during reentry. Last month, NASA decided to removethe problematic ramp altogether, work that Lindsey and his crew have watchedclosely. "We're well aware of what's goingon," Lindsey said, adding that his crew planned to visit NASA's New Orleans,Louisiana-based Michoud Assembly Facility--whereexternal tanks are built--to discuss the work and hand out merit awards tofacility workers. NASA spokesperson Jessica Rye, atthe agency's Kennedy Space Centerin Florida,said the STS-121 flight's external tank is expected to arrive at the spaceport in earlyMarch. Shuttle workers have already begunstacking the solid rocket boosters that will launch Discovery and the STS-121crew spaceward, with the shuttle itself is due to rollover to the massive Vehicle Assembly Buildingfor integration in mid-April, she told SPACE.com, adding that thosetimelines revolve around the delivery of the external tank. Some aspects of the STS-121 missionhave changed, including the task line-up for the spaceflight's three plannedspacewalks. "Our second spacewalk did have acouple of hours allotted for testing of the CIPAA system," Lindsey said. CIPAA, short for Curein Place Ablator Applicator, is a backpack-mounted device designed to mixand deliver a pink, ablative goocalled STA-54 into damaged shuttle tiles. William Gerstenmaier,NASA's associate administrator for space operations, told reporters last monththat engineers were likely to drop the CIPAA system. "That's one of the activities thatwe feel like we've done enough investigation on," Gerstenmaiersaid, adding that there were other potential techniques that were further alongin development and offered the same repair capabilities. In place of the CIPAA experiment,STS-121 spacewalkers Fossum and Sellers will likelyconduct ISS repairs or maintenance, Lindsey said. The crew will still place anastronaut at the end of a 50-foot (15-meter) orbitalboom--which will be attached to the end of Discovery's robotic arm--to testits stability as a repair platform, he added. The STS-121 crew is also expecting moreof a time crunch during the early days of their spaceflight. Unlike Discovery's STS-114 flight,which carried seven astronauts dedicated to new inspections and tasksinstituted after the Columbiaaccident, Lindsey's crew has six primary shuttle astronauts. Reiter is slatedto join the ISSExpedition 13 crew--commanded by Russian cosmonaut PavelVinogradov with NASA astronaut Jeffrey Williams asflight engineer--as the ESA's firstlong-duration spacefarer. "Prior to docking is probably whereit affects us most," Lindsey said, adding that Reiter will assist in generalshuttle tasks, but is not trained to aid the crew during operations like thecritical heat shield inspectionusing the orbital boom. "We always need to [ask]...are wetaking the risks for the right benefit," he added. "I believe we are. If Ibelieved we weren't, I wouldn't take the risk to fly."